Kids Crafts : 10 Water games that you have to try with your kids this summer! 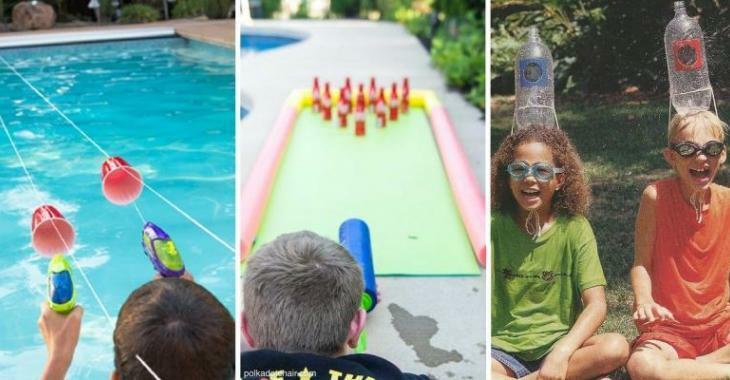 10 Water games that you have to try with your kids this summer! 10 games to make yourself! Collect jugs of milk or juice to make large recipients that will serve you to catch small ballons of water! How many can you catch without dropping them? Add a few drops of paint in water boilers! The children will be able to paint abstract paintings just like Picasso! Make a bowling alley with pool noodles! Use Cola can as pins, they have the ideal weight to be knocked down by a foam projectile. It's just like baseball, but it's so refreshing! Form two teams! With water guns, you will have to aim the hole! Whoever fills the bottle with as much water as possible in a predetermined period of time, wins the game! Sounds like a good plan doesn't it?! Don't spend money for one of these toys connected to the garden hose, make it! 2) Drill the noodle with the skewer at every 5 cm (2 '') approx. You can make this game, in or out of the pool! Piece an hole at the bottom of a plastic cup big enough for a small cord. Attach both end of the cord to a chair or anything that could be parallel. Repeat as much as needed for every kids to enjoy it at the same time. The first cup to reach the other side wins. You might need water guns with a big water tank to complete the race without any refills. It takes little material! Sidewalk chalk and wet sponges! And it's so much fun! In addition, we practice math! Yay! First the children will enjoy crafting their sponges, then they can start a sponge war! It's more enduring than a war of water ballons and they won't get hurt! It's MUCH simpler than you'd imagine and MUCH more resistant than you'd think! "And a lot of water!" 1) You will need plenty of space! 6) When finished, pull out the mattress outside, insert the garden hose into the hole and add water! 7) Seal the hole with the Duct Tape tape after wiping with a dry towel! It's really easy to do! !